Despite living in the age of e-readers, books are still a large part of life for many of us, even though figuring out where and how to store a growing collection can get surprisingly complicated. The obvious solution is bookshelves, which raises more questions: should you go with set-in bookshelves, shelves that dominate a wall, or small accent shelves? Of course, bookshelves aren’t the end-all, be-all of book storage. There are baskets, floating shelves—so many more options to choose from. Why not have a little fun? Don’t just store your books—decorate with them! 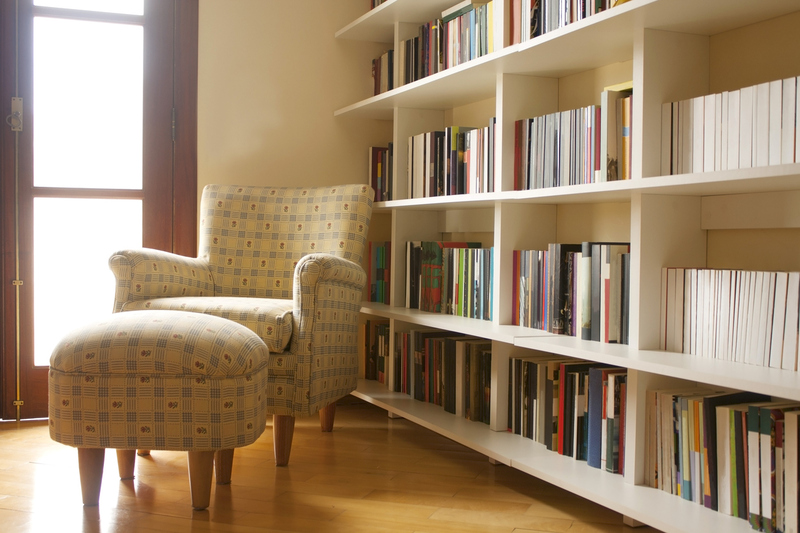 Here are some of the favorite ways to use books to add some style to your space. Arranging books by color is one of the most popular ways to decorate with books. In the photo above, books are used to create a beautiful rainbow of design. Using this method adds pretty pops of color to the room, creating an exciting sense of visual contrast, as well as a touch of playfulness. You can achieve this look using compartmentalized shelving, or, try arranging books by color across one long shelf, creating a long rainbow of hues. It’s a fun, artsy addition to any room.